Classic single stack from Sherman, CT. Historian may see it as part of the built environment, perhaps associated with an old building or road. Writer may feel compelled to describe it, knowing that individual words focus the attention. Artist may see it aesthetically, something that evokes feelings, something to be sketched or described. Scientist may see it as a rock garden, a local ecosystem, a place where the microclimates and soils are contrasting. Mathematician may see the line of the wall, the angle it makes with others, and the shapes and sizes of the stones. 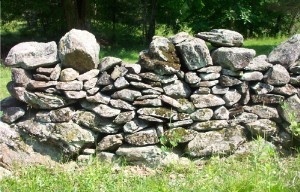 Geographer or traveler may wonder about the distribution of stone walls and how they vary across the landscape. Likewise, teachers of these different subjects can use the intellectual and aesthetic richness within every stone wall to their advantage, bring students of different interests to the same thing. At this grade level, we do not provide lesson plans. 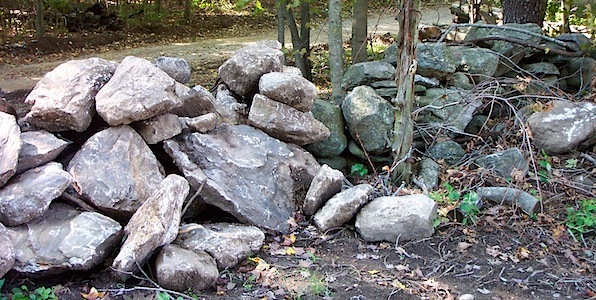 Rather, we suggest a series of activities and opportunities that stone walls provide. Link to the highlighted word above for specific instructional suggestions. Young (left) and old (right) sections of a wall are indicated by the difference in patina on them. Alternatively, link to Annotated Stone Wall Secrets: A Teacher’s Reference and cruise through the topics.